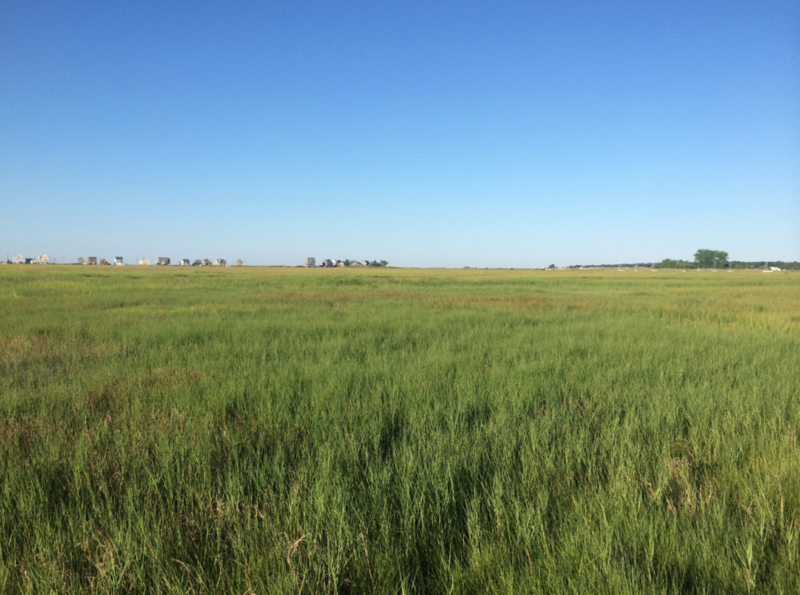 At SHARP, we like to bring volunteers into the field as often as possible to allow them to experience the marsh firsthand and teach them about the conservation of tidal marsh birds. This summer, the UConn crew was joined by Larry C., a high school student from Shanghai, China. Larry described his experiences in the marsh in the blog post below, to give others a sense for what a day in the life of a SHARP crew is like. Thanks, Larry! 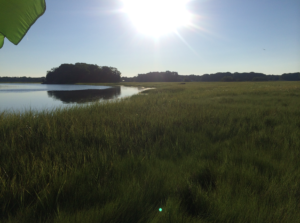 The mosquito-infested expanses of a New England salt marsh were undoubtedly a strange place to be at around 5:30 AM. With the croaks of a passing flock of chocolatey-brown Glossy Ibis overhead and the almost indiscernible poppings and squelchings of invertebrates moving through the moist vegetation underfoot, there was, however, a serene sort of quality to the place. Only thirty minutes or so away from Provincetown, (but then again, everything is thirty minutes away from everything else in Rhode Island) the John H. Chafee National Wildlife Refuge covered around 300 acres, and provided important habitat to various species of marshland birds, ranging in size from the Osprey with its 6 foot wingspan, to the tiny, mouse-like Ammodramus sparrows that scurry about like rodents in the shelter of the marsh grass. It is the sparrows for which we are here today, sloshing with hollow sucking noises through the damp marshlands. 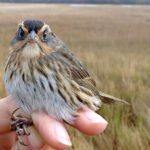 More precisely speaking, the Saltmarsh Sparrow (A. caudacutus) and the Seaside Sparrow (A. maritimus), two specialist species tied strongly to the coastal salt marshes. Despite being garbed in rather dullish, grey or brown colours, the species do possess subtle patches of brighter colour— the former sports an orange brow and ear, and the latter a patch of yellow at the base of the bill. As it were, however, plumage was not what these birds were known for anyway. Rather, they were notable, amongst other things for their status as an indicator species- the two Ammodramus sparrows were what biologists term ‘niche specialists’, species whose declines would be indicative of deteriorating health of the salt marshes. After a few painful minutes penetrating the thorny vegetation that had overgrown the trail down to Chafee’s salt marsh, we burst into the refreshing openness of the waterside, and in very little time, flushed two or three Ammodramus sparrows that fluttered off a short distance and plopped back into the reeds. With a heavy overcast sky hanging over us, we slogged north, heading to the banding plots, each of us carrying some sort of equipment on our backs or in our hands- nets, banding gear, poles, umbrellas, and folding chairs, to name a few. As we trekked deeper and deeper into Chafee, more and more signs of wildlife emerged- a minute legion of fiddler and sand crabs scuttling away before our feet, a squadron of cormorants shooting overhead like arrows, and the distant chestnut outlines of deer coming down to the waterside to drink. Finally, we arrived at one of the designated plots, where we set down our equipment and constructed a quick field-station. Next out were the poles and the mist netting, which were spaced out along in a long, undulating strip, at points crossing over canals and ditches. When closed, these nets were fairly evident from a distance- dark, thin-meshed, and fluttering in the breeze, they were fairly prominent. But as we began to get to work, the nets were pulled open, and as they were unravelled, so their name became more clear, as the netting became less and less visible to us (and hopefully to the birds too!). A view from the banding station, complete with a beach umbrella (top left), which we use to shade birds while measuring them. With the sun now ascending higher above the horizon, we began to get to work. 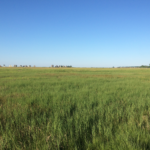 Weaving our paths across the marsh and clapping our hands, we flushed up Ammodramus sparrows from the Spartina grasses underfoot, sending them fluttering forwards towards the nets. Occasionally a sparrow would veer off, away from the nets, which would often result in an animated chase to try and get it ‘back on track’. The birds would not always fall for this, however, and would often veer away or drop into an out-of-reach patch of cover. Every now and then, however, a sparrow would hit the net (doing a sort of surprised stop in midair as they did so), which would result in a quiet celebration, as each sparrow represented a valuable fragment of data and information. As our flushing ended, we split off to different parts of the net, combing the structure and checking for entangled sparrows. Nor was it only sparrows that hit the net- we also managed to capture, amongst others, pugnacious and fiery Red-winged Blackbirds, sombre Song Sparrows, faery-like Yellow Warblers, and a wide array of insects, particularly Seaside Dragonlets and Greenhead Horseflies, both of which tended to get wedged within the netting. The other birds were taken note of, and were recorded, though it was still the Ammodramus sparrows that were the center of attention. Each, after careful extrication from the nets, was put inside a soft bag and taken to the field-station, where we recorded the birds’ physical anatomical measurements, from the nalospi (distance between the tip of the bird’s bill to the forward edge of its nostril) to the coloration of its brow plumage. The process was quick and concise, in order to minimise stress and discomfort for the bird, and soon as we were finished, the birds were released, fluttering away back into the dark, damp recesses of their marshland home. 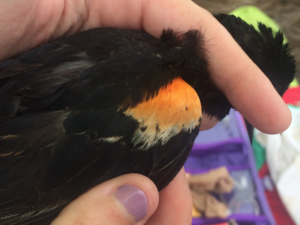 We paused while measuring this young Red-winged Blackbird male to snap a photo of his epaulet. These bright feathers on his shoulder will grow darker and more red as he becomes older and more dominant among males in the population. As the day wore on, more birds were flushed, netted, and banded. Although the process may have seemed routine from the get-go, or from an outside perspective, it was the opposite of uninteresting. Throughout the day, there was always something new, even if it did not show up in the form of a new queue of bird bags containing captures; sometimes, it would be the waddling pied figure of an Eastern Striped Skunk, complete with long, bushy tail, padding along amongst the grasses. Sometimes it would be the brightly flashing wings of a Willet, making a loud pass at a neighbour. And sometimes, it would be a distant splash, as some water-dwelling creature leaped clear of the surface to evade predators, or pursue prey. Whatever form it manifested itself in, novelty was a key part of that day at Chafee, and of my time working with SHARP in general; never a dull moment to be had.